Oftentimes, our orchid collections just grow randomly and haphazardly as we buy the odd plant here and there, at shows, from dealers, visiting speakers, and even nurseries and supermarkets. This is fine, but it can also be fun to plan the growth of a collection, to systematically convert a collection to higher quality plants, to acquire something unique, and to surprise both ourselves and our fellow exhibitors at shows or popular vote competitions. First, let me say a word on competitions such as orchid shows or club night popular votes. These should never be taken too seriously. If we reach the point where orchid growing or showing ceases to be enjoyable, then maybe it’s time to think about giving it away. 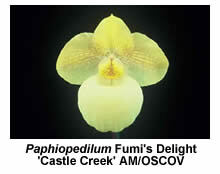 There seems to be a new terminology creeping through the orchid trade. 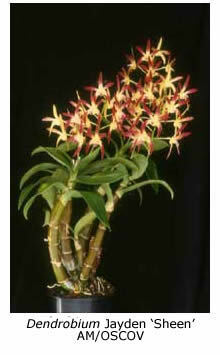 It is now possible to buy either of two types of orchids: pot plants or show bench plants. The pot plant seems to be predominantly for the general public, the person who wants to keep one or two plants or maybe buy one as a gift. They are supplied in bulk to supermarkets and general nurseries. Sadly, they often end up in the bin once they have finished flowering, because many people do not know the basic steps that need to be taken to get these plants to flower again the following year. 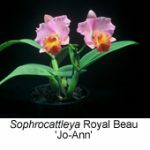 The show bench variety, on the other hand, is predominantly bred for orchid enthusiasts and hobbyists … for those who are constantly on the watch for plants that are a little better or a little different to last year’s generation. Anyway, back to planning a collection. 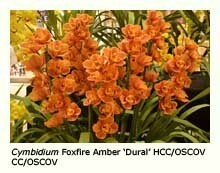 Most hobbyists cannot afford to go to their orchid supplier and buy up a collection of a few hundred, or even a few dozen, show-quality, flowering-sized plants. But not to despair, with a bit of planning, such a collection can be achieved over a few years. 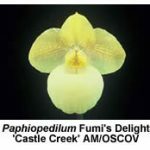 We need to be aware of the variety of ways in which orchids are produced, and then plan to obtain particular types of these in order to build the type of collection we want. One should be aware that divisions, mericlones and back-bulbs produce flowers identical to those on their parent plant, whereas seedlings will produce a range of flowers that generally have some of the characteristics of each of their parents. This year I will obtain one or two flowering-sized, show-quality plants. 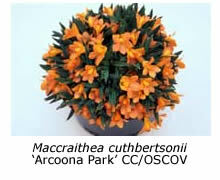 These should flower in the next flowering season, and are the quickest way to get good quality flowering plants. But how do we know what is a show quality plant? 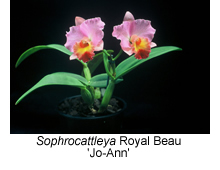 One way to find out is to keep an eye on shows, either by attending them or reading reports in club newsletters or orchid magazines, and taking note of the names of winning plants. 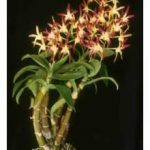 Ern Kettle has compiled a list of cymbidium hybrids that win regularly, and this has been published in OSCOV’s Many More Orchids in Victoria, and there is another list, by Julian Coker, published above. If you are unsure, seek the advice of an experienced grower. 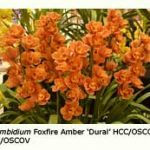 Prices will vary depending on the variety and availability of the plant, but for cymbidiums, as an example, you could spend between $30 and $200 per plant. Then again, you might win one in a raffle at much lower cost. This year I will obtain a few near-flowering-sized, show-quality plants. The same principle applies for this selection but these plants should flower in one or two year’s time. These should be cheaper than flowering size plants, and you are now investing in the future. This year I will obtain some mericlones of show-quality plants. These will usually be smallish plants, either in or not long out of their flask. If grown well, these could be expectedto flower within 3 to 5 years. A hobbyist would not normally buy a full flask of mericlones unless there was a reason for having a large number of identical plants. Again, these plants will be available at a lower price but will be an investment for the future. I will keep a lookout for back-bulbs of show-quality plants. From a back-bulb, it should be possible to grow a flowering-sized plant in 3 or 4 years. A few nurseries occasionally have back-bulbs but you would be more likely to get these from a fellow hobbyist. This year I will obtain some seedlings from show-quality parents. In the orchid world, the term seedling is used for plants raised from seed. These can be any size, and are not necessarily the small, recently germinated plants that are called seedlings in the regular nursery trade. Now you are getting into the exciting stuff. Each seedling will be unique, and different from other seedlings of the same cross, just as brothers and sisters in a family are different. Sometimes the flowers will be mediocre, but every once in a while you will end up with something special. An interesting way to buy seedlings is to get a batch from the same cross, and see how they turn out. Purchase either a flask or a compot (which is a community pot containing a number of seedlings). Again, it will be a few years before results are seen, but it is generally well worth the wait. This year I will produce my own hybrid. Rather than selecting from crosses that someone else has made, make your own. Select a couple of plants that you really like, and that you think would make beautiful babies. Cross-pollinate them, harvest the seed capsule, and have a laboratory produce some flasks of your very own seedlings. You are probably looking at 5 years to first flowering, but wouldn’t that be exciting? Information on how to do this is available in orchid books, on the Internet and in an article by Andre Cleghorn further below. This year I will obtain something different. A sure way of having some success at shows is to present something that no one else has. 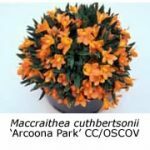 At present, there still aren’t a lot of terrestrial orchids or African orchids in collections, and one often stumbles on something unusual or different at orchid nurseries and trading tables. This year I will dispose of a number of plants to make room for new ones. Many experienced growers suggest that we should keep fewer orchids but grow them better. If we get too many orchids to manage we will not be able to grow them to their full potential. Plants that become surplus to our requirements can be given to other growers, particularly if we want to encourage beginners, or they can be sold at the trading tables that many clubs operate. If you get to the stage where you are dividing plants, propagating from back-bulbs, and/or raising seedlings, then the plants you dispose of could well provide the income for your new and improved acquisitions. Don’t forget that, even if you do decide to work to a plan, you can still buy a plant you like just because you like it. No one ever said that everything in an orchid collection has to be show quality.